Data-Driven Marketing Campaign Optimization | Constellation Research Inc.
Executives are being challenged like never before to keep up with the rapid rate of change in the digital marketing technology space. Executives must master a combination of strategy, budget, people, process and technology—all as part of the selection, implementation, use and optimization of digital marketing technology. As the days of mass marketing are gone, successful chief marketing officers (CMOs) must now be able to micro- target and hyper-personalize with relevant content, offers and interactions. 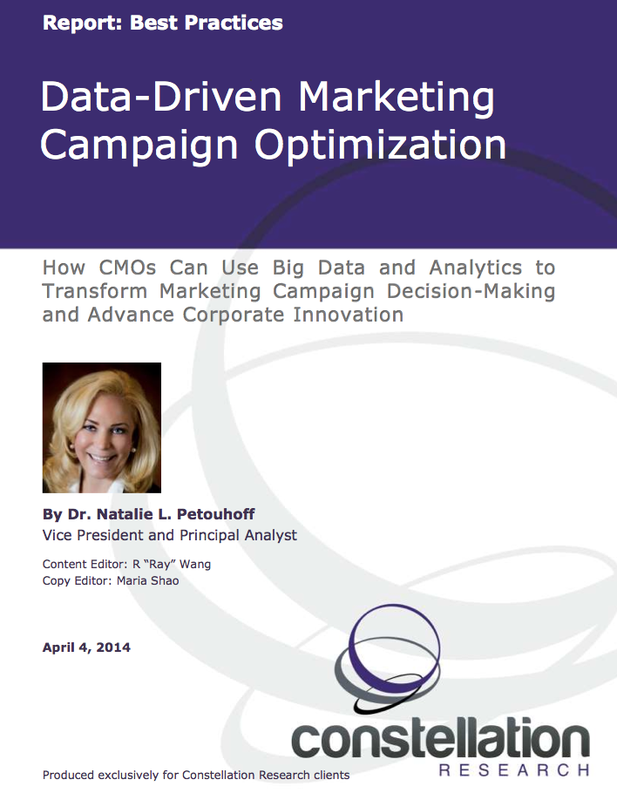 This research looks at what is required for organizations to combine marketing automation technology and analytics to optimize the campaign process so that it results in not only the best options for individual campaigns, but advances the entire organization’s business goals and keeps the customer experience at its highest possible level of engagement so that it drives long-term customer lifetime value. The advancing complexity of marketing technology is accelerating and deepening the need for a greater understanding of how Big Data and marketing analytics can drive better business results. This research provides marketers with a framework to evaluate how well they are incorporating data analytics into marketing automation. Using this framework will help marketers to not only identify what level they are at when using data analytics to support marketing campaigns, but also help them evolve their company’s data analytic capabilities to optimize bottom-line results.